It may be hard to watch but security footage of a two-and-a half-year-old boy falling between the platform and a train provides a heart-stopping reminder to all of us to be more cautious when travelling on trains with our little ones. 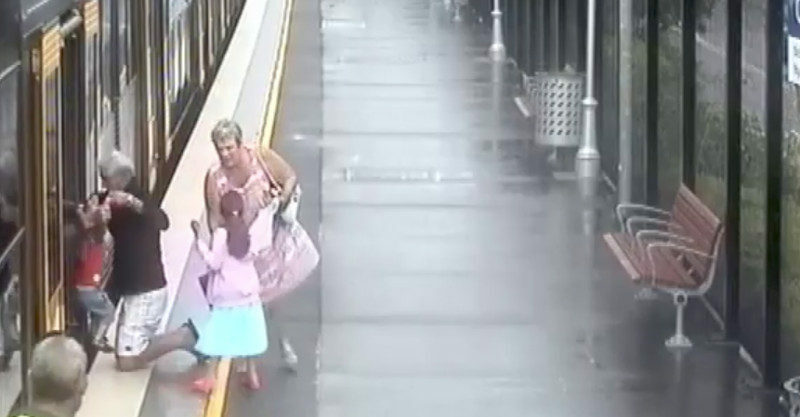 Sydney Trains released the CCTV footage this week and revealed more than 220 children had similar falls across the network last year. In one of several CCTV clips released we can see grandfather John Brewster, his wife and their two young grandchildren attempting to board a train at Cronulla in January last year. The footage reveals that it takes just seconds for their sweet family outing to turn into near-tragedy when John’s toddler grandson Ayden falls through the gap. The below footage shows the moment Ayden slips between the gap as he goes to step on the train. His grandparents step off the train and frantically signal to those on the platform to halt the train. A panicking John snaps into action, laying down on the platform to reach down the gap to pull his grandson from the tracks back up to safety. Thankfully John was able to get his grandson to safety in time, but the shaken grandfather said that it left him in shock. “It took years off my life. I’ll never forget it,” says John in an interview with 9news.com.au. He is counting his lucky stars that the accident didn’t end in tragedy. “It blows me away what could’ve happened with a little less luck. It’s divine intervention,” he says. As the videos were released, Minister for Transport and Infrastructure Andrew Constance called for vigilance from parents and carers, especially in the busy holiday period. “We’ve got school holidays and the Easter Show upon us, and with packed trains and excited kids it’s more important than ever to be keeping an eye on children,” Mr Constance says.